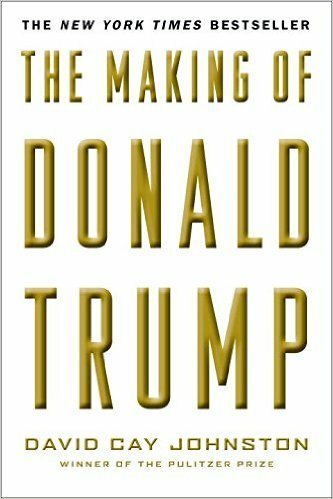 Click here for 3 full quotes from Donald Trump in the book The Making of Donald Trump. This book is the first journalistic retrospective on the 2016 campaign, published after the primaries and before the general election. It's written by David Cay Johnston, a long-time journalist for the New York Times and USA Today. Johnston says he wrote about Trump because "I would be writing a book about Hillary Clinton but for the simple fact that in 1988, my career took me not to Little Rock, Arkansas, but to Atlantic City, New Jersey. What I have attempted to do here was take my direct knowledge of Trump documents I've collected in my nearly half-century as an investigative reporter, and focus on the aspects of Trump's conduct that I think are most important for voters to ponder before they cast their ballots" (Epilogue, p. 205). Johnston has plenty of material on Trump, and is well-credentialed to write about Trump. But he utterly failed in his attempt to convey his "direct knowledge" in a way that is "important for voters to ponder" � and he failed for exactly the same reasons that Trump succeeded. Johnston is the elite establishment media that Trump complains about � and Trump is 100% right that "investigative reporters" like Johnston stack the deck against candidates like Trump. Johnston betrays his lack of bias in the book's closing pages: "Whether one adores Trump or is aghast, his public conduct should prompt us all to think about what qualities we want in our political leaders and why there is so much opportunity for someone like Trump to garner tens of millions of votes." That sort of condescending anti-Trump sentiment is exactly why Trump supporters despise the mainstream media as elitist know-it-alls who just don't get that Trump voters consider the mainstream media and the political establishment as one and the same. p. 15: Trump received a $12,000 annual trust fund payment starting at his birth, which at the time was "four times the typical income for a married couple with children." p. 93-4: Trump filed six bankruptcies, two more than the four bankruptcies raised by the press as a campaign issue. p. 144-5: Trump claims to have slept with the future First Lady of France, who denies it. p. 177-204: Trump wooed and beat wealthy gamblers at his casinos, earning millions of dollars, as detailed in two full chapters. Johnston concludes that "Investigative reporting is about facts that are not announced in press releases or spoken in presidential addresses, but that lurk in the dark crevices of government, business, and human relations. It is a trade in which the calling is to shine bright and focused light into unwelcome places for society's benefit. It is not surprising that Trump is always attacking journalists as unfair... I was not surprised when he threatened (again) to sue me" (p. 207). Yup, all the facts, all the time--and that loses all the votes in these cynical times. Johnston intends that excerpt to illustrate why he is so right about Trump, but in fact it illustrates why Trump won--because Trump understood that voters don't care about fact-checking or facts, but do care about condescension from an elitist establishment. Johnston wrote this book to explain why Trump should lose--but instead exemplified why Trump won. Didn't vote in any Republican primary from 1989 until 2016. Talked about running for president since 1985. Anti-corruption laws ensure that Trump profits from campaign.